You're not ready for Halloween until you have the symbolic black cat decorations. Catty Corner has the collectible vintage, one of a kind, and discontinued cat items just in time for Halloween. These kitties are waiting to go on fun, spooky adventures with you and your family. 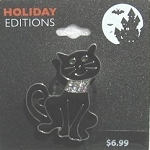 Halloween black cat flags, stationery, jewelry, figurines, coasters, bakeware, cookie cutters, and more. Black cat and kitten party decor include tea light holders, Halloween cat plates, candle holders, paper plates, tablecloths, napkins, and candy bowls. Need to relax after a long night of trick or treating? Curl up with a good book. Find Heathcliff and Garfield getting up to some of their classic antics.